A weird error that happened when I tried to add a tag to an already saved bookmark during yesterday’s maintenance work of Delicious. Apart from the tag, there was no data loss. 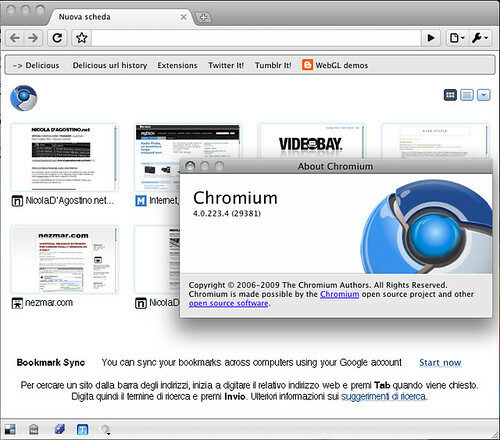 In the last days Chromium developers have changed (i.e. 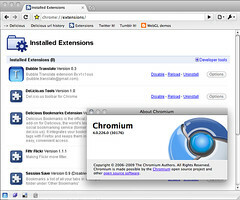 polished) the way the internal extension page looks, with a header, better listing and favicons, which also show in the bookmark bar. 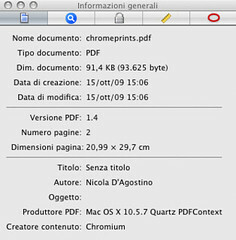 With Mac Chromium 4.0.223.1 (29108) it’s now possible to print web pages (yes, 4 months after the first release). What is still missing? Well, the bookmark manager, bookmarks sync with Google Docs and the creation of Application Shortcuts.